It’s been exactly 7 years since I summited one of the world’s highest peaks, Mt. Kilimanjaro, 6 years since I ran a Half-Marathon and, probably, 5 years since I even went camping in the desert. My life, which once read like an adventure handbook filled with solo travels and thrilling escapades, was now a regular domestic chronicle featuring bedtime stories and play dates in between endless chores. No complaints there, but lately I’d begun to question whether I’d erred in jettisoning adventure so completely from my life. Naturally, I was looking forward to the ‘Extreme Adventures’ session, which featured four hardy travellers, including one woman! I was hoping to vicariously enjoy their adventures, and perhaps, even be inspired again. The panelists included Mark Evans, who’d led expeditions in the Arctic, and had kayaked around Oman in 55 days, Julie Lewis, who’d led expeditions in 20 countries, including the Arctic and Antartica, Richard Parks, who’d done the Seven Summits and the three Poles in seven months, and finally, Ted Simon. How do I begin to describe Ted Simon? 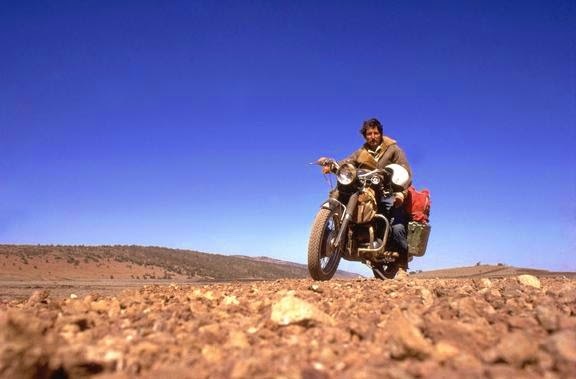 He set off in the 1970s on a 4-year-long motorbike ride across the world. He did it again 40 years later when he was a septuagenarian. In between those years, he’d kept himself busy walking across Eastern Europe, journeying across the British Isles and pioneering organic agriculture in California! And here he was at a Lit Fest in Dubai, well into his 70s, curiosity, wanderlust and energy still intact. Even before he started speaking, I was impressed. He continued, “Another word is adventure. Nowadays it has come to mean any kind of exploit. Whereas I feel the only real adventure is when you set out into the unknown.” He added that there had to be a mental element to adventure, something ‘illuminating’. Each of the panelists was asked about what drove them to set out on their adventures. Parks shared that the insecurity and uncertainty he felt after an injury forced him out of a promising rugby career drove him to test his limits of his endurance. Lewis shared that as a child she received a globe as a present, and by spinning it and pointing to a place, she would transport herself there. That was what set off the wanderlust in her. “Every child should be gifted a globe,” she remarked, with a laugh. Lewis felt that the anxiety that people experience in modern times is because of a disconnect with nature. She urged that people disconnect from their smart devices and go outdoors to discover themselves. For a couple of the panelists, writing about their exploits proved as equally revelatory as the adventure. As Simon shared, “I’m a writer, not a motorcyclist. I write to explain things to myself.” He also pointed out that there was a difference between exploits that are turned into books and exploits that are undertaken with the hope of them being turned into a bestselling novel. What’s the most crucial item to have on an extreme adventure? Zips, apparently! Both Evans and Parks put this down on their must-have list, while Simon also added elastic bands. Simon felt that too much preparation was unnecessary. “You have deliver yourself to the world and let it look after you,” he said. He also added that since he didn’t have to return to an office or answer to anyone, he was free to become a part of wherever he was. The hour-long session ended way too soon, and it seemed almost unfair to have four hugely interesting people share a stage, when you could listen to each of them for hours. Still, I left the hall feeling invigorated and open to the possibility of adventure. 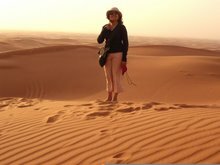 I might not be found atop a mountain anytime soon, but maybe I’ll make my way up a sand dune, with the little cub in tow. packers and movers in gurgaon is the best paking. moving and shifting company. local packers and movers in hyderabad is very helpfull for people when they want to shift locally or out of hyderabad. panchang where you can find daily panchang, and match your kundali for kundali with your girlfriend and wife. And success! Now, will you blog more again? :) This is a very interesting and interesting article. Like this.